New Orleans City Councilwoman Kristin Gisleson Palmer is calling for an end to a longtime arrangement that diverts about half of the Regional Transit Authority’s hotel tax revenues to the tourism industry. A one-percent sales tax — approved in 1985 to fund transit — is the agency’s primary revenue source, bringing in about $78 million in 2017, according to the RTA’s most recent annual audit, nearly four times the revenue from rider fares. The portion of that tax from hotel sales is expected to bring in about $12 million in 2019, but only about $6.3 million of that will go to the RTA, according to estimates in a recent report from the Bureau of Governmental Research. Under an agreement signed nearly two decades ago, the rest is split between the New Orleans Tourism Marketing Corp., the Morial Convention Center and the city, which uses its portion for tourism promotion. Based on projected 2019 hotel tax collections, BGR estimates that those agencies will get $2.7 million, $2.9 million and $400,000, respectively, from the RTA this year. New Orleans voters approved the sales tax to fund the RTA through a ballot initiative in 1985. The initiative specified that the revenue would be “dedicated to transit and transit-related purposes.” Previously, the one-cent tax had been split between the RTA and the city. The 1985 ballot language also stipulated that the tax wouldn’t apply to hotel room bills. But in 1999, the RTA sued the city to force it to collect hotel taxes on its behalf, arguing that the hotel exemption was invalid. A coalition of hotels and tourism entities, including the Tourism Marketing Corporation, quickly intervened, hoping to maintain the exemption. Before the case went to trial, the RTA settled with the tourism groups. The transit agency entered a cooperative endeavor agreementwith the Tourism Marketing Corporation: The sales tax would apply to hotels. The RTA would get 60 percent of the first $7.2 million in annual hotel tax revenues, and 40 percent of anything above that. The rest would be split primarily between the Tourism Marketing Corporation and the Convention Center, with the city getting a small share. The day after the agreement was signed, on June 2, 2000, Civil District Court Judge Terri Love accepted the terms of the settlement, ruling that the hotel exemption was unlawful. “Money geared towards public transportation should go to public transportation,” she said. Palmer’s pronouncement comes in the midst of a growing, statewide debate over the amount of public dollars flowing to the tourism industry. Mayor LaToya Cantrell has taken the firm stance that more hotel tax revenue should go to general municipal services, such as water management and public safety. 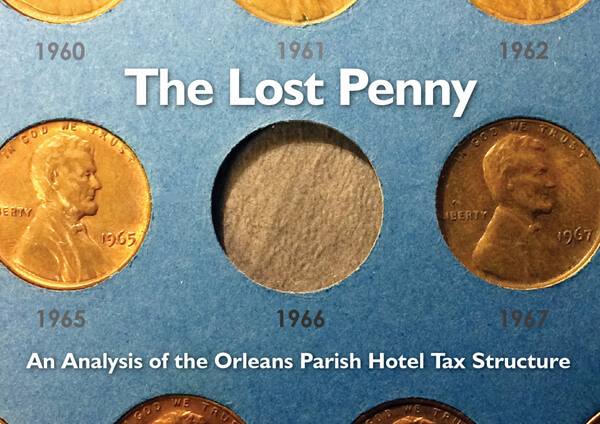 Most hotel tax revenues are used for tourism marketing and infrastructure. State Governor John Bel Edwards joined the fray in November, opposing Cantrell’s idea and saying that the money should remain in the hands of tourism entities. More recently, the governor’s staff has been meeting with city officials about the issue, according to a report in The Advocate. Following the release of a BGR report recommending that a greater share of hotel taxes go to the city, a spokeswoman for Edwards said only that the office would take a look at the recommendations and discuss them with the Cantrell administration, the convention center and state legislators. At a Tuesday’s Community Development Committee meeting, council members heard a presentation from the BGR about the recent report, which found that 75.5 percent of Orleans Parish hotel taxes go to tourism — the highest proportion when compared to to a dozen peer cities — while only 9.5 percent goes to general municipal services. Public schools get another 9 percent. The RTA’s share, after the transfers to tourism, is about 3 percent. The committee also heard reports from the Data Center and The United Way about how working-class residents, especially hospitality workers, are struggling to cover the basic costs of living as wages fail to keep pace with housing prices. As the chair of the council’s Transportation and Airport Committee, Palmer took a particular interest in the RTA sales tax. “When you look at the breakdown of where money from the hospitality industry is going, it’s just kind of egregious that they’re also getting some money that was approved by the people for public transportation,” she said. She added that there is a direct connection between higher costs of living and the need for more expansive and reliable public transportation. Under the RTA tax-sharing agreement, the Tourism Marketing Corporation is required to use some of its share to support the RTA and “actively assist” the agency to secure federal and state funding. Romig said that promoting tourism in general helps the RTA because visitors utilize the city’s streetcars. He said that the Tourism Marketing Corporation also provides direct support by promoting the RTA in their advertisements. The money for the Convention Center is dedicated to the Convention Center’s Phase IV Expansion Project. That project was abandoned after Hurricane Katrina, but the payments never stopped. A second cooperative endeavor agreement that set up the special Convention Center fund stipulates that the first agreement cannot be canceled until all bonds secured using the RTA payments are liquidated. In 2012 and 2014, the Convention Center used the RTA payments to refinance old loans. Those bonds aren’t set to expire until 2027 and 2025. However, the first agreement specifically says that the bonds must be “issued to fund or finance in whole or in part construction of the Phase IV Expansion.” Since the expansion was nixed, it’s unclear whether these outstanding bonds would prevent the RTA from canceling the agreement. The overlapping cooperative endeavor agreements, lawsuit, original ballot initiative, and outstanding bonds make it difficult to know whether the funds could be redirected back to the RTA in the short term. Palmer said she doesn’t yet have specific plan for how to do that. She said she previously brought the idea to former Mayor Mitch Landrieu’s administration but got no answers. “I brought this to the previous administration’s attention many times, and I was told, ‘Don’t open this can of worms,’ ” she said. Romig told The Lens that if the agreement was canceled, the hospitality industry could challenge the hotel portion of the RTA tax. “My sense is that if you undid the CEA the hotels would just say, ‘We’re not in the original [ballot] initiative so you’ll lose the benefit of what those dollars were doing,’ ” he told The Lens.